Friends of Family Planning Art Show Opening Gala, 6 to 8 pm. Freddy Kruger (Jackie Earle Haley), the quintessential bump in the night, is now even darker and more ghoulish, tormenting the dreams of a group of small town students until they are afraid to fall asleep. 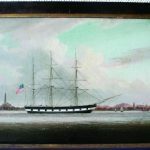 In 1907, Theodore Roosevelt was President, Albert Einstein formulated E=mc2, Oklahoma became the 46th state, Rudyard Kipling won the Nobel Prize for Literature, the country's first transatlantic radio transmission occurred, bubonic plague broke out in San Francisco, a loaf of bread cost five cents, and Mary Lynch Fisher was born. Every so often, living on the Vineyard provides an opportunity to press your nose against history and breathe in the connection between now and then. 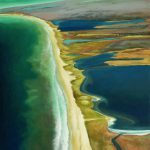 Painter Kara Taylor, whose Kara Taylor Gallery on Main Street in Vineyard Haven, is showing new and striking work, "From Above," a result of her flying over the Island taking aerial photographs that she translated to paint and canvas. There has been some rearranging at the Simon Gallery in Vineyard Haven, and in addition to Peter Simon's photographs, the result is more room for the dramatic display of Ronni Simon's metallic wire and beaded wall sculptures, her wearable art jewelry, and a new section for her longtime passion, yarns for knitting. From his first appearance in 1984, Freddy Krueger has become the quintessential bump in the night, terriorizing suburban teenagers. The sunny day seemed to be cooperating with the occasion: warm, festive, and everywhere one looked — art. 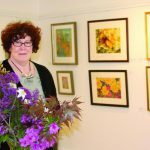 The subject was flowers, and the petalers were out in force this past weekend when Featherstone Center for the Arts opened its Arts & Flowers Garden Tea Party & Fashion Show. Greenberg (R)Director Noah Baumbach ("The Squid and the Whale," "Margot at the Wedding") brings out the best in Ben Stiller and Greta Gerwig in this slow moving, funny/sad character study. It's hard to have a romance with Stan (Alex O'Loughlin), a come-lately Mr.
"There's a Light to Starboard, Sir, right off our lee bow!" Tom Hale, 28 pages, printed in 2010 by Tisbury Printer. There are quiet conversations among the family about the weather and shouldn't Ilana be wearing a hat, and there they are strolling through fields of wildflowers under springtime blue skies, along country roads, through old town squares, and pausing to place stones of remembrance on the monuments to those who died on the forced death marches out of Austrian concentration camps.